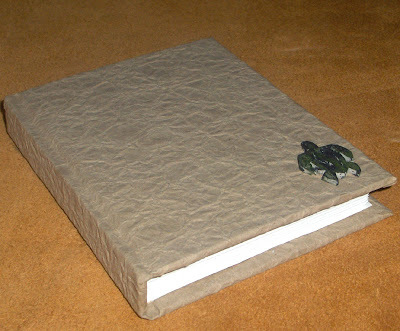 Maiko, aka Flurrsprite, made this unique Tapa Honu Book for the book swap. Using a crinkled brown bag, she simulated tapa, a bark cloth made in Polynesia - and specifically in Hawaii. The little honu, sea turtle, is carved from a piece of book board and painted with watercolour paint and block printing ink. 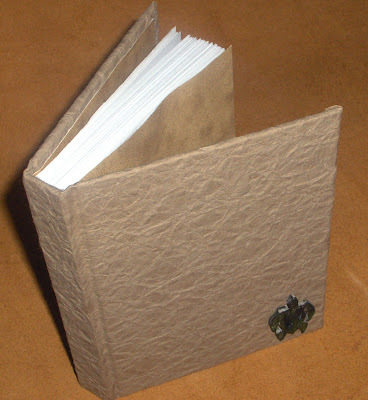 This hardcover, case bound journal has over 100 pages of white cardstock, and beige endpapers. Visit Flurrsprite.Etsy.com to see more of her work. Fabulous job! I love the turtle and the crinkled paper bag is genious! really great, maiko. i'll admit, i do have a weakness for all things hawaii inspired. i think i was a hula dancer in a past life. I love, love, love the turtle. Very clever! I received the book in the book swap and it was a nice surprise! Thank you, Maiko.